This 3-story garden-view home was designed with family 'ohana' in mind! Our spacious condo (one of the largest units in Puamana) will comfortably sleep up to four adults and three children. The first floor features an open layout with a fully-equipped kitchen and new top of the line appliances. An island inspired living room and dining room make 'talking story' each night one to remember! The master suite features a king-sized bed with high quality linens, a flat screen TV, individual a/c unit, and a private master bathroom. The 2nd bedroom is bright and breezy with a queen platform bed and tropical decor. Both baths have been newly remodeled with designer taste and top of the line fluffy towels. 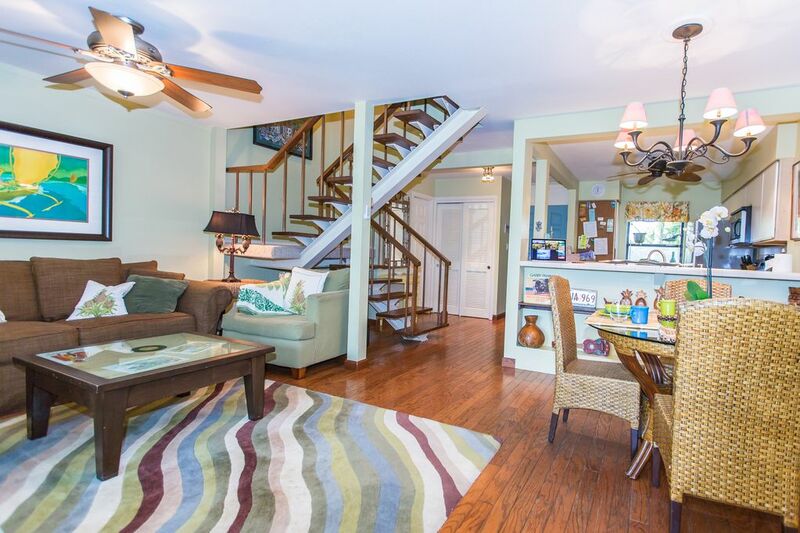 The third floor features a large loft/playroom for the kids and sleeps 3 comfortably. It sits high in the tree tops and offers both mountain and ocean views. Puamana is a private gated community on 30 acres of lush tropical gardens, open spaces and beachfront. Your family can roam the property in the safety of 'old Hawaii' and enjoy our 3 private pools, tennis courts, and beautifully remodeled club house. separate units in each room. 4 total. The house was very comfortable and the location is so convenient. This house just had everything we needed. It had all the appliances you would need along with dishes. Having 2.5 bathrooms really made it easy for everyone and the beds were comfortable. I know I slept really good. We had a few animal visitors which was fun to watch such as a duck and chickens.We used the washers and dryers at the clubhouse and the pool was really nice there. The pool overlooks the ocean which is so beautiful at night. The location is very convenient being so close to downtown Lahaina. We’ve been to Maui 3 times now and I have stayed in a condo, a hotel and now this house. The house has been the best stay out of all three. Having wifi was also an extra bonus. I would definitely recommend this house to anyone who wants to be near Lahaina where there are so many things to do and the location makes it really easy to get on the highway to go sightseeing. Thanks so much for the nice review. I am so happy you and your family enjoyed your stay. Puamana is a truly special place. I hope you will return soon! I stayed here with my parents (70+) and child (8) over Spring Break. I would rate this place a 4.8. Amenities were great, grounds were really nice. People super friendly in the area and Joanna was excellent in communication and quick to respond. Beds were comfortable as was the house, Joanna has lots of useful things in the house (boogie boards, beach towels, snorkeling gear) that are available for use. She also left quite a generous 'care package' and check in and check out were super simple. Overall great! The house could use a bit of touch up in a few spots. As with any tropical place, you have to expect ants and Joanna has helpful information with this, but we did leave some cereal/pastries on the counter that became inundated with them so we had to throw out. Property butts up to Highway 30 (one lane each way) and the road noise was noticeable the first morning, but as the week progressed, we did not seem to notice it. Over all would strongly recommend this vacation home. This home was absolutely perfect for our family vacation - there was 4 adults and 3 teenagers - so the layout was perfect! The neighborhood is right on the beach, with the most amazing oceanside pool and easy access to the neighboring beach without having to go back on the highway. The kitchen was great- we filled the counters and frig with snacks and drinks-which saved a lot of money during our week there, it was also very well stocked with every utensil, pots and pans, and lots of dishware and glasses! The owner has stocked the back patio with everything needed for the beach including large, fluffy beach towels. One of the big bonuses it was a relatively short 10 minute walk to Lahaina so if you didn't want to have to find parking or just wanted to walk to town for a meal or shopping it was along the road closest to the beach - not the main road. We have stayed in other areas on Maui and Lahaina was my very favorite, very laid back and not too far if you wanted to drive to other beaches. The unit was super clean and well decorated - made me feel both at home and on vacation, I always need good sheets and good towels and this unit has that and so much more. I was going to buy the heavy shampoo, conditioner and body wash when I got there - but both bathrooms were stocked! The downstairs closet had an assortment of things you may need so check there too - we left our extra items such as Solarcaid for sunburns (you can tell teens but they don't always listen) behind as well. The unit is not on the beach but the neighborhood is - so just a very short walk away - and it does back up to the road - but we kept the doors closed and couldn't hear it unless we opened them, it did not bother us, but if you wanted to sit outside it could during busy times of the day. All in all the unit was great and so was the owner who was only a text away with any questions we had! We recently vacationed in Maui and stayed in this townhouse- our family of 4 plus another couple. There was plenty of space in the house- upstairs loft was perfect for the kids! Overall was a great stay- only "little things"
-lockbox on the door is a pain to use- easy to open but not easy to get relatched- we ended up just keeping the key out for the length of our trip. -house was clean but not "deep clean". Dirt along the stairwell and along edges of walls- I know that it is tough to turn over in just a few hours between renters but I am just a clean freak :) A bunch of scuffed up trim throughout too that could be touched up to give better presentation. - ANTS.. Owner had a photo with a lot of helpful hints about the place and fully disclosed that pests are a part of paradise- I was just surprised that ants were found frequently. Make sure you don't leave any food on the counters! We had a box of doughnuts (closed) on the counter and they still got in. -Owner has boogie boards right there for your use- THIS WAS AWESOME!! We used them a lot- as well as the umbrella & beach chairs. Also had beach towels there for us- was wonderful! There are bicycles there also but we could not figure out the combo for the bike lock..
Property is roughly a mile from front street- not quite easy to walk since there are not sidewalks the entire way and road is narrow. But easy drive to Front Street, the shopping mall, etc. This condo was perfect for us... my husband and I, our two adult kids and their significant others. The kitchen is newly remodeled and has everything you need. The condo is very well kept, and upon arrival there was a thank you gift for us that was very thoughtful. There are 3 bicycles, some buggy boards and a BBQ located in the back patio area to use. Some of our best memories in Maui were made there at the condo, barbecuing steaks and chicken all while sitting and enjoying each others company outside. Felt very at home. It's a short walk to Lahaina, where we spent a lot of time. The gated community was a plus, the grounds are clean and well maintained. There is a gym located at the club house for a reasonable fee. There will be an addtional charge of $10/night by our homeowners association. This fee is taxable and has a $160 max.